1 To provide treatment and care for sick, injured and orphaned wildlife with the ultimate aim of rehabilitating them back into the wild. 2 To inform people about, and to create public awareness of, wildlife and all issues relating to the benefit of wildlife. Wildlives will provide care and basic medical treatment for wildlife, and ensure that a bird or animal gets veterinary treatment where required. With all animals brought into the Centre, the ultimate aim will be release them back into the wild. In order to do this successfully, it is necessary to ensure that they achieve a very high level of fitness and mobility (far in excess of that which would be sufficient for a domestic pet). Furthermore, this must be done without 'taming' the animal. An animal with no fear of people will, sadly, not live very long in the wild. 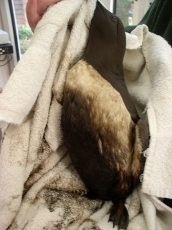 Oiled birds cost a great deal of time and money to clean, treat and rehabilitate. Wildlives has a no-euthanasia policy. The policy is one that everyone at Wildlives feels very strongly about: whatever the animal, and whatever state it is in, if there is a chance that it will recover and have a quality of life subsequently, all attempts should be made to save its life. The alternative view (or one of the alternative views, rather, for the subject is controversial) is that, by euthanasing those animals that have a worse than average chance of survival, that would require expensive treatment, or that might not survive in the wild on their own subsequently, more resources will be available to spend on those animals that do have a good chance of survival. Clearly, this is true - not only with money, but also with regard to time - and staff at Wildlives have often felt the force of this argument. When a surprisingly exorbitant sum is spent on having a hedgehog's leg amputated, and the little creature subsequently dies, it is easy to say that the money would have been better spent elsewhere. Similarly, the cleaning of oiled birds takes a great deal of time, and after all the work, it is sometimes found that the oil is much stronger and thicker than expected, and the bird will die. The other side of the coin however, is when animals that Wildlives has taken a chance on surprise everybody and recover. It is the release of healthy animals that makes all the hard work and stretched finances worthwhile. Sometimes, it is clear that an animal may never return to the peak of health required for it to survive in the wild - and yet it could still have a good quality of life in captivity. In such a case, it may either remain at Wildlives as a permanent resident, or is found a new home with suitable facilities. 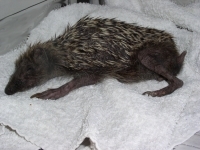 For example, occasionally hedgehogs have been brought to the Centre with no sight at all. Since such creatures would not be able to survive in the wild, they are 'adopted' by people with walled gardens, after all appropriate home checks have been carried out. The little amputee hedgehog that didn't make it in the end More.